We service Ashland and Wayne counties and part of Medina, Richland, Lorain, Summit & Holmes counties. We also deliver to Middlefield and surrounding communities! Getting Started: Apply for an account by filling out a credit application. Centerra Co-op is teaming up to support the Stefanie Spielman Fund for Breast Cancer Research at the Ohio State University Comprehensive Care Center-Arthur G. James Cancer Hospital and Richard J. Solove Research Institute. 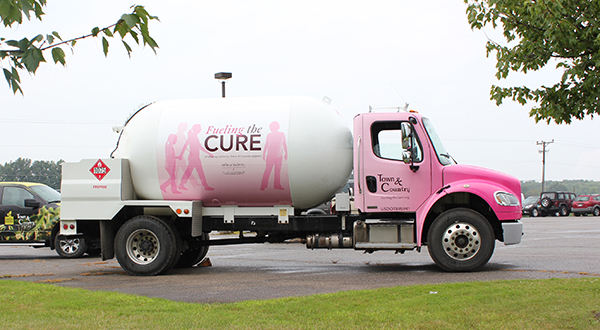 Look for our Fueling the Cure propane delivery truck serving North Central Ohio to promote cancer research and prevention. For each delivery stop, we donate $1.00 to cancer research. Join us in the fight by matching this $1,00 when we stop at your home. Learn more about the campaign by contacting our propane department at 888-738-7678. More about Fueling the Cure at www.fuelingthecure.org.